Thanks to our technologies you can produce top quality gluten-free pasta. Start producing excellent texture gluten-free pasta, to stand out among your competitors. Our technological offer obviously enables you to produce several dry pasta shapes. But we do not come to a halt. Actually, we make it possible no-glut fresh pasta production, even filled. Moreover, it is also possible to produce gluten-free instant pasta. Choose your market, the rest is our job. In these last few years the demand for gluten-free food has been growing at an ever-increasing rate. E.g. 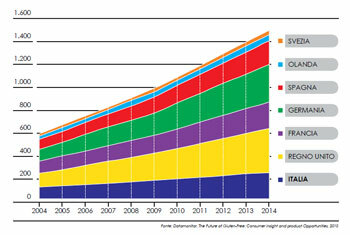 in Europe, we have gone from 600 to 1500 million dollars in a decade. A top-ranking product, such as that one you can obtain using our plants, can guarantee a competitive edge. You can produce with our modern and innovative technology the traditional Italian pasta, suitable also for no-glut dieting. Gluten-free pasta market has been recently developing many shapes based on the usage of corn and rice starches, plus additives. These products, once drawn dry pasta only, are now also fresh, both filled and non-filled, thanks to the greater diffusion of pre-mixed raw materials. Machines and pasta plants for expressly using pre-mixed raw materials. Products as follows: fresh, dry and instant pasta. Production capacities: ranging from 50 to 500 kg/h. 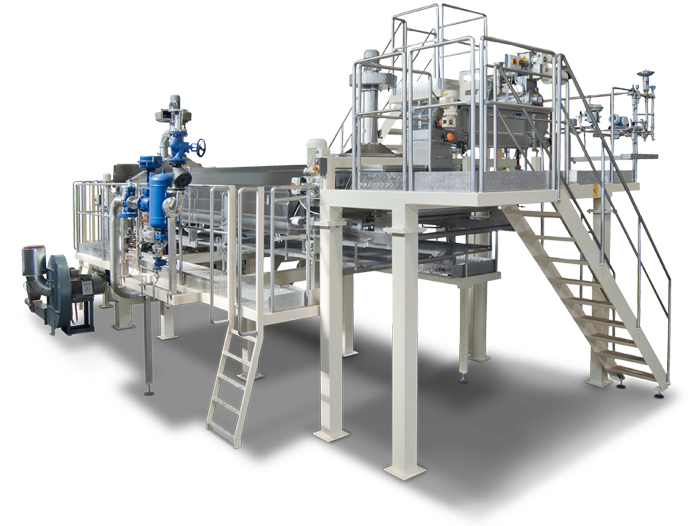 Pasta plants equipped with pre-gelatinization system for using raw materials and suitable for larger productions. Products as follows: dry short pasta. Production capacity: 500 kg/h. Technology for no-glut pasta production using pre-cooked flours supplied by Storci or other dough mix available on the market. Reduced investment compared to the NO-GLUT RAW technology and results guaranteed by prearranged lab tests. Our machinery can manufacture also pre-mixed products existing on the market. On request, Storci’s Laboratory can test the results of mixtures suggested by Customers. To win the public’s trust, it is essential to stand the comparison with „grandma’s lunch“, a challenging job. Storci knows it and for this reason offers state-of-the-art machinery, able to manufacture a product that mirrors, both technically and qualitatively, the hand-made tortellino. Storci’s technology plus is the outcome of a study analysing different needs, so that can perfectly adapt to the usage of non-conventional raw materials, such as those needed for gluten-free production. Would you like to produce a good dry pasta with no durum wheat semolina, using raw gluten-free flours? 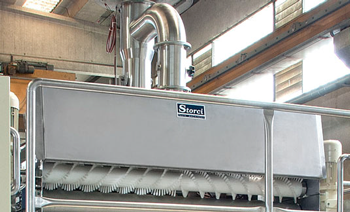 Storci No-Glut Raw pasta plant is specific for producing gluten-free pasta using raw corn and rice flours, starches, and various mixtures: the pasta making factory becomes self-reliant. No glut-raw is not cooked in the tank: the dough is pre-cooked on the belt, thus obtaining the best quality, with no limits. The dough does not lump up, heat and humidity are distributed evenly preventing an irregular cooking: this is the main cause of the white spots on the pasta surface. Specific dosing systems and other extra units guarantee a homogeneous precooked dough and high quality. The final product quality is higher and can be more monitored compared to the gel technology. The organoleptic quality of the pasta is higher as well as the gelatinization stability. Besides, the production costs are lower. the quality of the pasta obtained, before purchasing the system or the line. Highly qualified experienced staff will help you sell top quality pasta to your Customers. (*) After evaluating the conditions of the lines. (**) Crossed contamination during manufacturing does not allow producing certified pasta suitable for celiacs.